I always chuckle at that phrase, from the time we heard Eddie Murphy say it as Donkey in Shrek. I don't think that it is entirely true, at least as far as the food goes, but it just may be true regarding waffle weave! 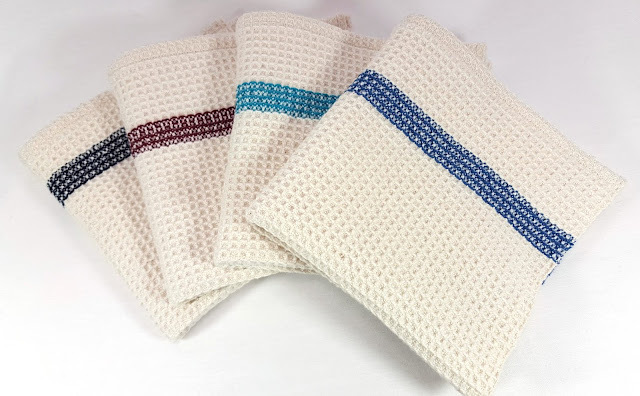 When I first learned to weave, waffle weave towels were high on my list of things to try. I just loved the texture, that 3-dimensional aspect of the little cells that are produced; it was like magic. 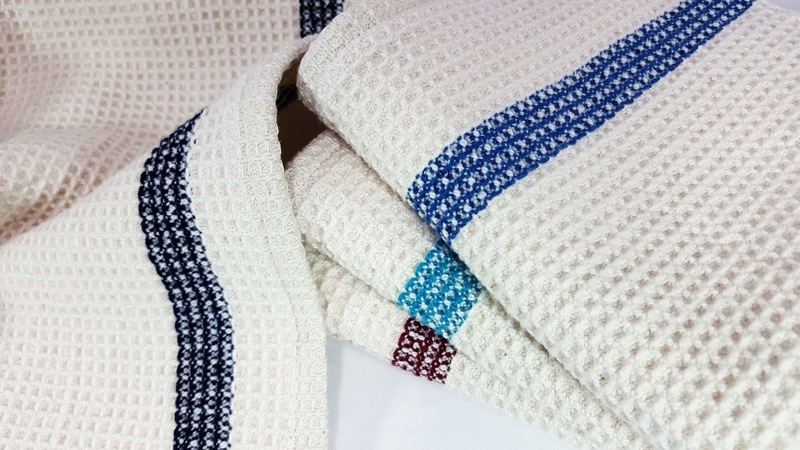 I tried to weave a towel, and mostly it worked, though there were quite a few errors. A few years later, I tried a different version, which also mostly worked, but this one seemed to have floats that were a bit more worrisome, though I can't tell you why now. I then found an eight shaft pattern that had a more subtle texture, but no long floats. I loved this one and made several. The last towel on that warp was a shortie, so I kept it and keep it at work to dry my lunch dishes. Recently, I've tried to come up with something a bit different to weave. After a recent run of 12 towels, I needed a break from that particular item, and I have been ruminating on a new scarf design, but that was't quite ready. 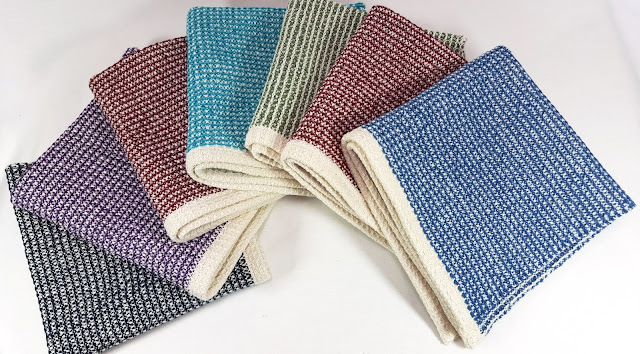 So, back to waffles I went and wove a long warp of wash cloths! I wove 16 in all, measuring 12.5" square. One became a casualty of the teeth of my temple, which somehow broke the weft in two places, so that one stays here. 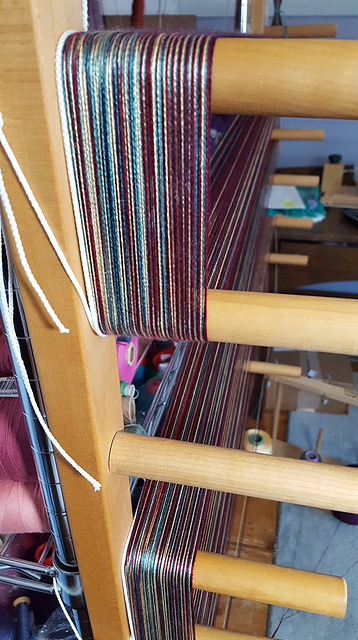 I used natural Supima cotton for the warp, and that plus some colored cotton for the weft. 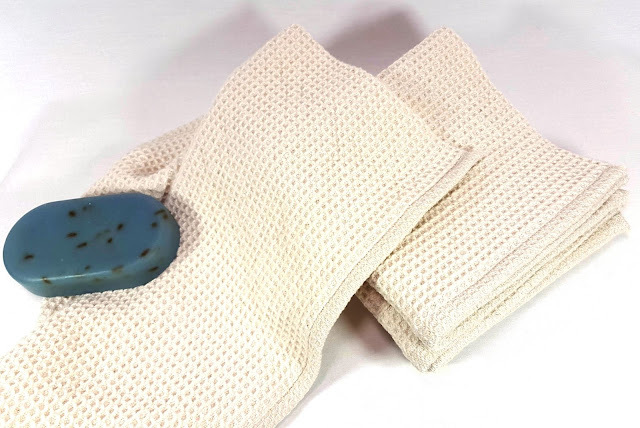 There are 4 all natural-colored ones"
They are very soft, but durable, and can be used as a face cloth or dish cloth. And that scarf design I was mulling over? 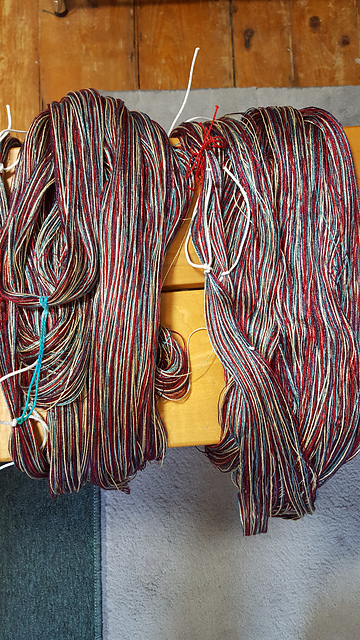 I ended up deciding to try a 4-shaft version of Echo weave using rich colors of tencel. I'm shooting for two more infinity scarves, but you'll have to wait a bit to see the cloth. That's all the weaverly news for now. The weather seems to be starting its slow crawl toward spring, and with the time change, it is light so much later that one can forget that it is well below freezing in the morning. Soon, though. Soon. Your selvedges and hems on these towels is IMPRESSIVE!! I've only done waffle weave once, but after wet finishing both my selvedges and hems were very wavy. Wanna share your draft?